GW 501516 (or Cardarine) is a research chemical developed in the 1990s to prevent and cure tumour formation in the colon, prostate, and breasts. Studies done in the early 2000s have found that GW 501516 and other PPAR agonists have also been able to stop metabolic disorders such as obesity and diabetes through specific gene expressions. As research continued to grow, bodybuilders quickly caught on to GW 501516, calling it the ultimate endurance enhancing supplement. GW’s ability to burn off excess fatty tissue, enhance recovery, and dramatically increase endurance has made this product a staple in every athlete’s cycle and PCT. With no harmful side effects found in the past 20 years, no wonder why GW 501516 has become a legend in the world of sports and athleticism. Gives you an overall sense of health and wellbeing. You’ll feel amazing while you’re on it. THE PRIMARY ROLE is GW’s ability to rid the body of unwanted fatty tissue and it has become almost LEGENDARY. The chemical compounds in this particular PPAR agonist functions in differentiation of adipocytes. Much like growth hormone, GW 501516 generates proinflammatory markers in adipose tissue and decreasing the activity of genes involved in lipogenesis. This means that the body is able to block fatty acid chains from forming and being stored as fat. The study is quoted stating: “physiological and pathophysiological functions of PPAR and generated novel strategies to treat metabolic diseases”. The activation of these particular genes in the body has been seen to burn body fat at such an alarming rate that it is being coined “the cure to obesity”. The 2015 study by Wei Chen, PhD and his colleges has also found that dramatic increases in the PPAR gene in slow twitch muscle fibres increases oxygen usage and greatly increases endurance. The enhanced endurance was seen in lab mice with a normal oxygen supply and those with oxygen restrictions which provided significant evidence that GW501516 targets and enhances skeletal muscle endurance and recovery time to a supraphysiological level. A study titled “A metabolomics study of the PPARδ agonist GW501516 for enhancing running endurance in Kunming mice” stated that BCAA were spared during trials of intense exercise which allowed the mice to have a greater rate of recovery in muscle tissue and neurotransmitters. These rats had even lost weight while maintaining a high fat diet, suggesting it could potentially prevent obesity and help manage weight regardless of eating habits. This is what makes Cardarine so incredibly popular and usable over long periods of time. In certain studies, there have even been signs showing the reversal of diabetes, obesity, Dyslipidaemia and many other diseases. In contrast to popular belief, GW501516 doesn’t promote damage of liver cells. The chemical has actually been known to promote healthy liver function and faster healing properties to the skin and muscle tissue. In essence, you will not heal rapidly like Wolverine from the X Men movies, but you will shorten your recovery time from scratches, blisters, and injured muscles by a significant amount. There has been many forum comments expressing the concerns of GW501516 and its relationship to cancer and tumour development. The hypothesis for this controversy stems from GW’s ability to improve angiogenesis in the body at an extremely high rate and the rate of cancer growth in the colons of lab mice. Angiogenesis refers to the body’s ability to increase blood supply to feed the cells throughout the body. This is a common occurrence among endurance athletes and children going through adolescence. Scientist had speculation that if there were tumour cells active in the body, that they would be especially susceptible to angiogenesis and cause the tumour to grow at a much faster rate. Since 2004 many experiments have been done to prove this hypothesis, but so far, all of them have been largely unsuccessful. “…shown to have no effect on the proliferation of colorectal cancer cells” and “…under normal culture conditions, PPAR activation has no effect on cell growth”. Keep in mind that this study was done in rats given amounts of 400 mg a day and was abused and ran for hundreds of weeks to top it all off. Time and time again this study has been refuted and shown to be deeply flawed and inaccurate. In a 2008 experiment done on human breast cancer and colon cancer cells, not only did the PPAR agonist GW 501516 prove to be safe for use, it has proven to inhibit cancer cell growth. The National Institute of Health has confirmed without a reasonable doubt that GW 501516 inhibits a multitude of cancers in human cells. Over a decade of research studies on human PPAR beta (the primary target of GW) has only proven a decrease in cancer cells with extended use (up to two years). The confusion for these previous allegations of cancer growth were from results published in 1996 and have long since been abandoned due to new clinical research. The chemical compound has been dosed in human PPAR for a number of years and has only provided positive results on cancer treatments, liver function, and metabolic efficiency. In all of the human studies done so far, there were no noticeable side effects at all while running GW. Stacking Cardarine means running it in combination with other compounds. What makes Cardarine stand out is it can be used with almost anything (cutting, bulking or recomping). Bulking – clean up your gains and make that bulk cleaner while maintaining size. Cutting – totally optimal when it comes to weight loss while holding on to muscle mass. 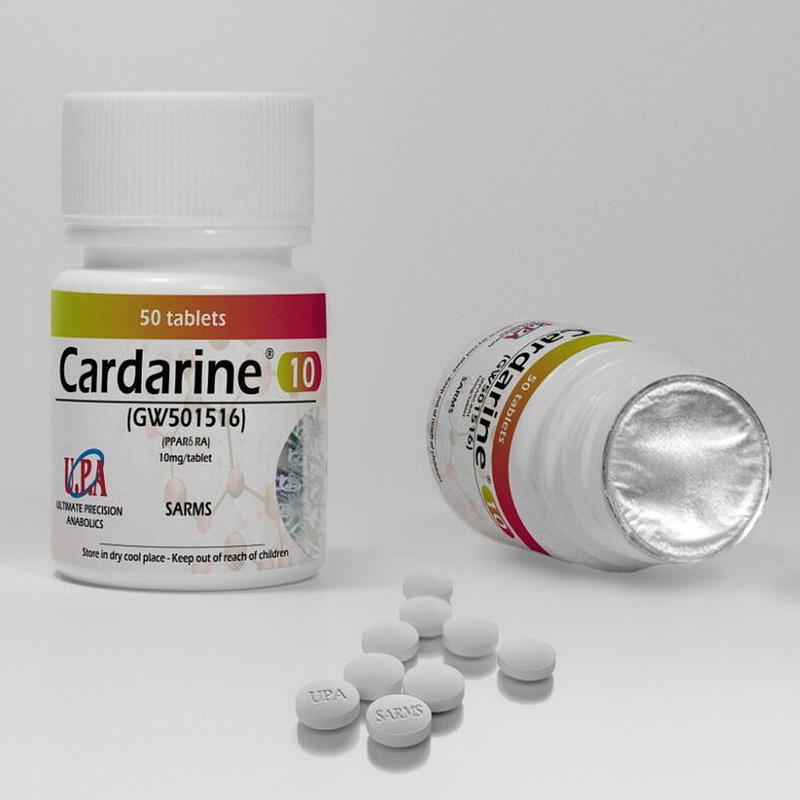 The most common way to use Cardarine is in a triple stack involving LGD 4033 and MK 2866. You’ll have all the gains, endurance, fat loss and size gains by taking all three.